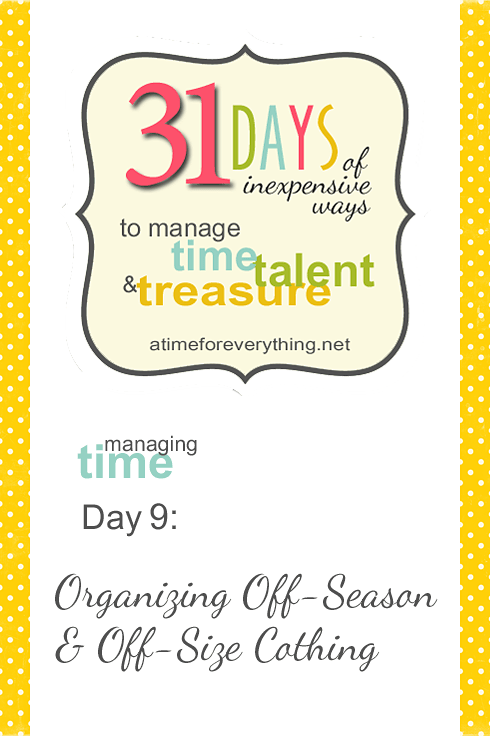 Organizing and storing off-season and off-size clothing can be a challenge, and it’s important to have a system so that the items on hand are not forgotten. With three boys, there are clothes and shoes that get handed down from the older brothers to the younger one, and sometimes we have to store them for a few years until the little guy grows into them. I also try to stretch our dollars by purchasing clothing at the end of a season to have for the following year, and I have to make room for those. And of course there are the winter coats, hats, gloves, and snow boots that don’t stay in the closet all year long. Our furnace room has very basic shelves made of bare wood that were put in before we bought the house, and they are perfect for this purpose. I can fit seven 54-quart Sterilite containers on each of the two shelves and have four stacks of three underneath. The top shelf holds memento boxes, but the other shelf and everything underneath contains kids clothing, shoes, and my husband’s and my winter gear as well. The bigger the clothes and shoes the more space they take, so our storage needs have expanded over the years! The purple lids are for our daughter’s items, and the blue lids are for the boys. I organize by size (or in the case of winter items, season), put a label on, and rotate upcoming sizes to the front as needed. At any point, I can check and see what my kids are going to need for the next season or size. This is immensely helpful for shopping. 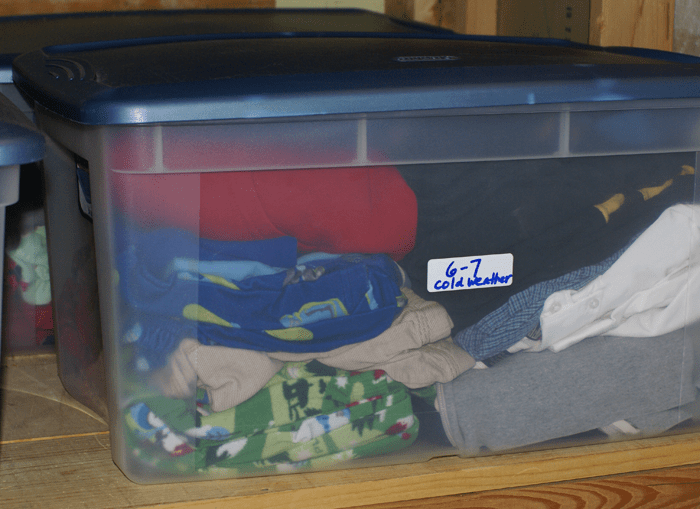 You may not have a storage room where you can place so many containers and keep so many upcoming sizes. But with whatever space you do have available, I encourage you to develop a system that will help you keep track of what your kids have and what they will need so that you don’t buy duplicates and can stick to that clothing budget!